Here is Insulation Automobile Wire Supplier talking about Suitable for flame retardant cable. If you have any idea about High Quality Ev Car Cable, welcome to contact us and discuss. Can be laid indoors, tunnels, cable trenches, pipelines, flammable and severely corroded, but can not withstand mechanical external forces. It is necessary to bear the external force of the machine and add the steel tape armor. Features: In the case of open flame burning, remove the fire source, ≤ 12s automatically extinguished. It can be laid indoors, in tunnels and in pipelines, and can withstand certain laying traction, but the cable can not bear external force, and single-core cable is not allowed to be laid in magnetic material pipeline. It is necessary to bear the external force of the machine and add the steel tape armor. Can be laid indoors, tunnels, cable trenches, pipelines, flammable and severely corroded, but can not withstand mechanical external forces. It is necessary to bear the external force of the machine and add the steel tape armor. Suitable for special requirements, such as large-capacity power plants, nuclear power plants, underground railways, high-rise buildings, etc. At the same time, High Quality Fep Wires can be offered for you. 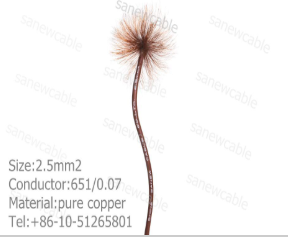 Looking forward to receiving your inquiry EV@sanew-cable.com.